Seismic measurements take many forms, and appear to have a universal role in the Earth Sciences. They are the means for most easily and economically interpreting what lies beneath the visible surface. There are huge economic rewards and losses to be made when interpreting the shallow crust or subsurface more, or less accurately, as the case may be. 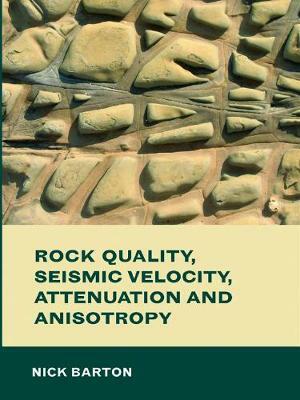 This book describes seismic behaviour at many scales and from numerous fields in geophysics, tectonophysics and rock physics, and from civil, mining and petroleum engineering. Addressing key items for improved understanding of seismic behaviour, it often interprets seismic measurements in rock mechanics terms, with particular attention to the cause of attenuation, its inverse seismic quality, and the anisotropy of fracture compliances and stiffnesses. Reviewed behaviour stretches over ten orders of magnitude, from micro-crack compliance in laboratory tests to cross-continent attenuation. Between these extremes lie seismic investigation of rock joints, boreholes, block tests, dam and bridge foundations, quarry blasting, canal excavations, hydropower and transportation tunnels, machine bored TBM tunnels, sub-sea sediment and mid-ocean ridge measurements, where the emphasis is on velocity-depth-age models. Attenuation of earthquake coda-waves is also treated, including in-well measurements. In the later chapters, there is a general emphasis on deeper, higher stress, larger scale applications of seismic, such as shear-wave splitting for interpreting the attenuation, anisotropy and orientation of permeable 'open' fracture sets in petroleum reservoirs, and the 4D seismic effects of water-flood, oil production and compaction. The dispersive or frequency dependence of most seismic measurements and their dependence on fracture dimensions and fracture density is emphasized. The possibility that shear displacement may be required to explain permeability at depth is quantified. This book is cross-disciplinary, non-mathematical and phenomenological in nature, containing a wealth of figures and a wide review of the literature from many fields in the Earth Sciences. Including a chapter of conclusions and an extensive subject index, it is a unique reference work for professionals, researchers, university teachers and students working in the fields of geophysics, civil, mining and petroleum engineering. It will be particularly relevant to geophysicists, engineering geologists and geologists who are engaged in the interpretation of seismic measurements in rock and petroleum engineering. "Let me first start my review by congratulating Barton for making such a cross-disciplinary effort in this book . . . Barton presents an excellent example of what could be accomplished with such collaboration by providing readers a wide perspective of the applications from both geophysics and geomechanics . . . I found the book particularly enjoyable to read since I am a strong advocate of the cross-discipline fertilization of geophysics and geomechanics. I would recommend it as a reference book to both geophysicists and even more to rock mechanics specialists because of the unique multidisciplinary coverage and immense references."